Giotto di Bondone (1266/7-1337) is considered one of the greatest artists of the Medieval Age and his biography is rich of curious anecdotes, but many of them are legends. According to the tradition, Giotto was born in Vicchio, in the Mugello, in a family of farmers that moved to Florence when he was a child. His parents gave him in custody to Cimabue, the famous painter. According to another version, Cimabue noticed the young Giotto while he was drawing a sheep on a rock, because he worked as a shepherd in the country near Vicchio. Many stories talk about Giotto’s extraordinary artistic abilities. He was considered very able in freehand drawing: according to Vasari, he was able to draw perfect circumferences without compass: this is the famous “Giotto’s O”. Another story talks again about Cimabue: while he was away, his pupil has drawn a lifelike fly on the painting he was working on and he tried to brush it off, because it seemed real. Because of this fact he understood that his pupil had outdid him: it was time for Giotto to open his own workshop! We don’t know for sure if Giotto was Cimabue’s pupil, even if they are often quoted together, above all for stylistic reasons. If this apprenticeship was true, Giotto could had follow Cimabue in Rome: here maybe he knew Arnolfo di Cambio, that made him work in Assisi. 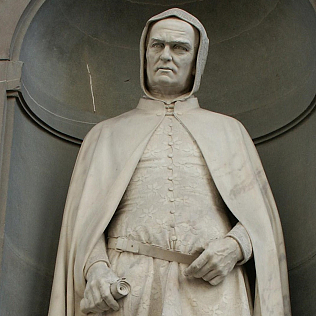 These are theories, because we don’t know nothing about some periods of Giotto’s life. For example, it is said that he was a very ugly man: probably this rumor is due to his origin. Deformities were very common in the countryside. Even if he was a great artist in town, people remembered his origin. However he had other activities: specifically, he rented out some looms to textile workers - who were too poor to buy one – and he made big profits. We remember Giotto because of his great contribution to the Western Art: he paved the way to Masaccio and to the Renaissance. The big interest for his figure - so important but also so far away from us - caused the creation of these legends. In Florence there are many of his works: his Campanile is the bigger one. He did not see it completed, because he died in 1337, while works were underway. He is buried in the Duomo crypt.